RoboDK supports all Motoman robot controllers since SV3. The following sections demonstrate typical operations using an SV3 robot teach pendant. Note: It is recommended to have the MotoCom software option. 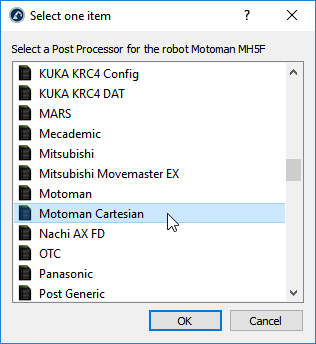 This is a software option for a PC provided by Motoman (usually by means of a USB dongle) which allows connecting to any Motoman robot directly from RoboDK. Robot drivers provide an alternative to Offline Programming (where a program is generated, then, transferred to the robot and executed). With robot drivers, it is possible to run a simulation directly on the robot (Online Programming). More information available in the Robot Drivers section. A connection between RoboDK and any Motoman robot can be established to move the robot automatically from a connected PC using RoboDK and Motoman’s MotoCom software option. This allows using the RoboDK’s Run on robot option for online programming and debugging. The connection can be established through a standard Ethernet connection (TCP/IP) or RS232 serial communication. This step is automatic and there is no need to set up anything specific on the robot side. Also, it is important to note that some Motoman robots have a coupling between joints 2 and 3. This means that joint 3 moves when the joint 2 is moved. In this case, the Robot joint behavior field must be set to Fanuc/Motoman.